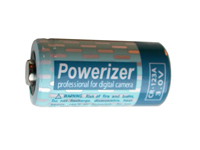 Cr123 batteries (sometimes referred to as CR123a) are batteries originally designed for camera's. They commonly used in duty flashlights for Law Enforcement, Security, Corrections and EMS. Although some lights are powered by AA or AAA batteries CR123 batteries are able to power the powerful lights. Small in size they can be a powerful force in keeping your flashlight working and your beam strong. The cells are lithium and average about 1500 mAh in capacity and can last anywhere from 45 minutes to a few hours. CR123 batteries come in disposable and rechargeable formats. Rechargeable batteries to replace the CR123 can come in the form of a single rechargeable that is a similar size as a CR123 or in the size that replaces two of the CR123a's for lights that use more than one CR123A. The rechargeable battery used to replace a single CR123 is a 16340 and are about 600 mAh. The rechargeable replacement for two CR123 batteries is the 18650. These can be anywhere from 2600 mAh to 3400 mAh.